The sixth important new name in comedy films is Rome-born Enrico Montesano, formerly as well-known television comedian and showman. He stands out from the others in his fondness for the proletarian "oddball", always based on a meticulous observation of really existing human types, and for his allegiance to Rome, its quarters and hits dialect: by no accident he was perfectly equipped to replace Manfredi in the stage revival of the musical comedy, RUGANTINO. Montesano has been active in films since 1970, first in a long series of pictures - more farces than comedies - in which he was the partner of the late Alighero Noschese, the best-known Italian imitator and a popular television entertainer, all of them directed by Bruno Corbucci. 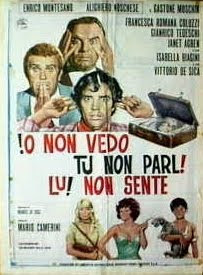 The same couple reappeared in a film directed by Mario Camerini, IO NON VEDO, TU NON PARLI, EGLI NON SENTE (I NO SEE, YOU NO SPEAK, HE NO HEAR: 1971), a re-make of a previous film by the same director, CRIMEN, a delightful parody of mystery films. Subsequently, the actor turned his interests to modern comedies, like LE BRAGHE DEL PADRONE (HIS MASTER'S BREECHES: 1978) by Mogherini, from the novel by Terzoli and Vaime, or PANE, BURRO E MARMELLATA (BREAD, BUTTER AND JAM: 1977) by Giorgio Capitani, from a French play by Francis Dorin, adapted to the screen by numerous teams of scriptwriters, including Montesano himself, the director and Giuseppe Patroni Griffi. In the highly enjoyable first episode of QUA LA MANO (GIMME YOU HAND: 1980) by Pasquale Festa Campanile, he is a modest carriage driver in modern Rome, who has a mania for betting and who one day lets himself be persuaded to bet that he would appear with the Pope in St. Peter's Square to bless the faithful. So he starts lying in wait to approach the Pope and the two men become fast friends (the Pope is Philippe Leroy, whose foreign accent and modern style clearly allude to the present Pope). Along with modern comedies, however, Montesano has also appeared in several satirical films set in other historical periods, the best of which is IL LADRONE (THE THIEF: 1980) by Pasquale Festa Campanile, which follows the adventures of a thief in Palestine at the time of Christ.